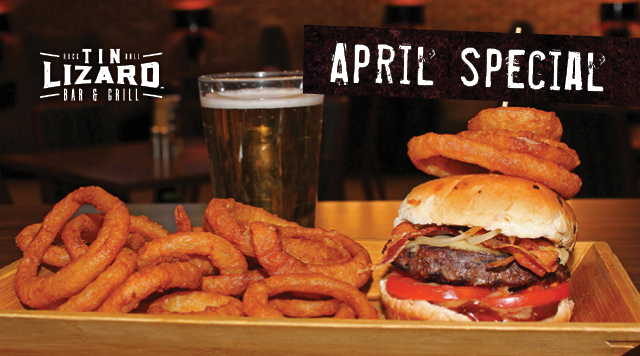 Tin Lizard Bar & Grill Join us in April for our Old English Pub Burger special! Old English Pub Burger - Bacon burger on an onion roll, topped with HP sauce, grilled tomatoes, beer cheese, baked bean purée and beer battered onion rings. Served with a 16oz domestic draft beer. Get it for $13.95 during the whole month of April at the Tin Lizard. While supplies last. Valid from April 1 - 30, 2019. Only offered in the Tin Lizard Bar & Grill. Price does not include tax or gratuity.